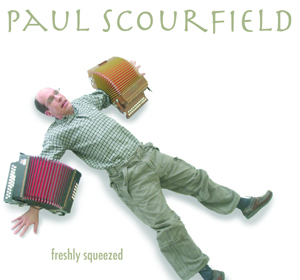 "Freshly Squeezed" captures Paul's solo repertoire. It is mainly traditional English in flavour, with a mixture of tunes and songs. The album features Jon Loomes on fiddle, guitar and hurdy gurdy and also Michael Beeke on recorders and english border pipes. £12 including post and packing. To purchase online, click the Buy Now button above. Payment is via a secure Paypal system. You can pay by credit/debit cards using this method even if you don't have a Paypal account. If you would rather pay by cheque, please send an email via the contact page to arrange the details. The album is also available to download from itunes or from amazon (see www.amazon.co.uk). If you are in the US the album is available from distributors CD Baby, see http://cdbaby.com/cd/paulscourfield. The track listing for the album is as follows. You can listen to three tracks from the album on the Music page. "......The accompaniment to the songs demonstrate Paul's sensitive mastery of the instrument........There are so many great tracks here it is hard to pick out favourites, but top of my list would be the final track, 'If you will not have me, you may let me go'........ This is a CD well worth having in your collection. If you're not going to buy it straight away, put it on your Christmas list!" "......Paul uses the instrument to its fullest, and allows it to display uncharacteristic harmonisation and tenderness, something not often associated with melodeons! The tunes bring in the greater variety of instruments, creating a full, driving sound and highlighting some splendid fiddle and guitar work. Jimmy Lyons Highland/Harry Cox's Schottische and The Vine Tree/Lovely Nancy are outstanding." "....an intelligently sequenced and finely balanced mixture of tunes and songs.....his consummate musicianship winningly carries through the sequence, both leaving you generally wanting more and also desiring to revisit a large number of the tracks at an early opportunity......."
"....He makes the melodeon work to its full potential with punchy melodies and imaginative use of bass buttons...the little ditty Billy Bones and his Dancing Cat is an absolute gem, and one I'd like to add to my own repertoire...."